The suspect was taken into custody after a standoff in Clermont County, Ohio. A veteran sheriff's detective was shot to death and his partner was injured in a gun battle with a 23-year-old suspect in an attempted burglary, who was allegedly suicidal and barricaded in an apartment building in a suburb of Cincinnati, Ohio, officials said. 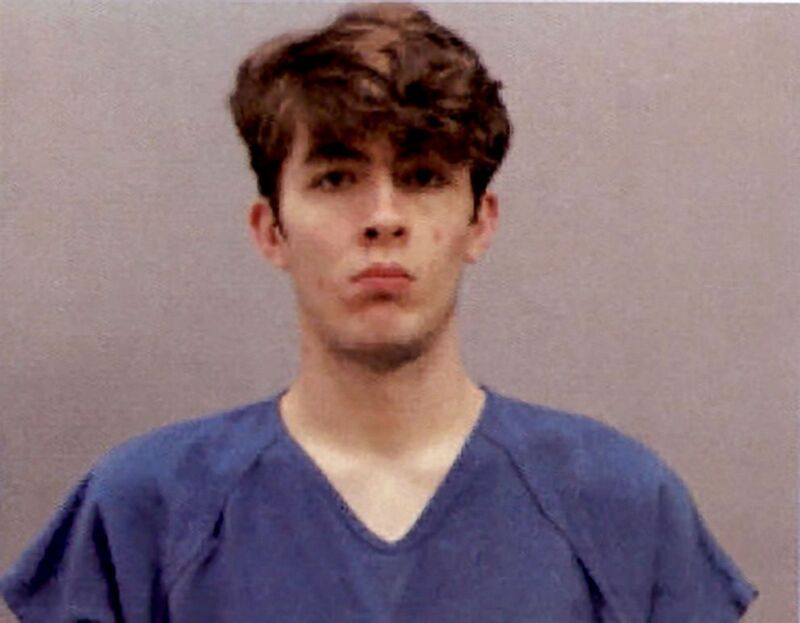 The alleged shooter -- identified as Wade Edward Winn -- kept police at bay for some 12 hours before he was taken into custody Sunday around 6:30 a.m. following another gunfight with a SWAT team, officials said. 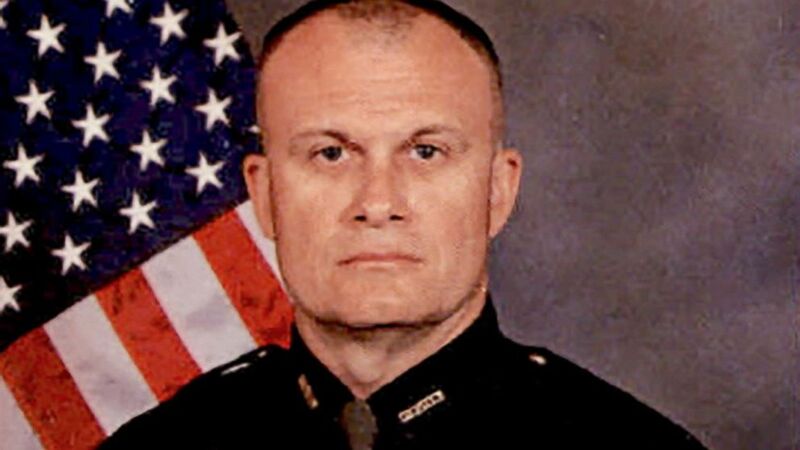 Killed in the confrontation was Detective Bill Brewer, the married father of a 5-year-old son and a 20-year veteran of the Clermont County Sheriff's Office, officials said. (Clermont County Sheriff's Department) Detective Bill Brewer, a 20-year veteran of the Clermont County Sheriff's Office, died after being shot while investigating a 911 call on Feb. 2, 2019, of an allegedly suicidal man barricaded in an apartment in Pierce Township, Ohio. 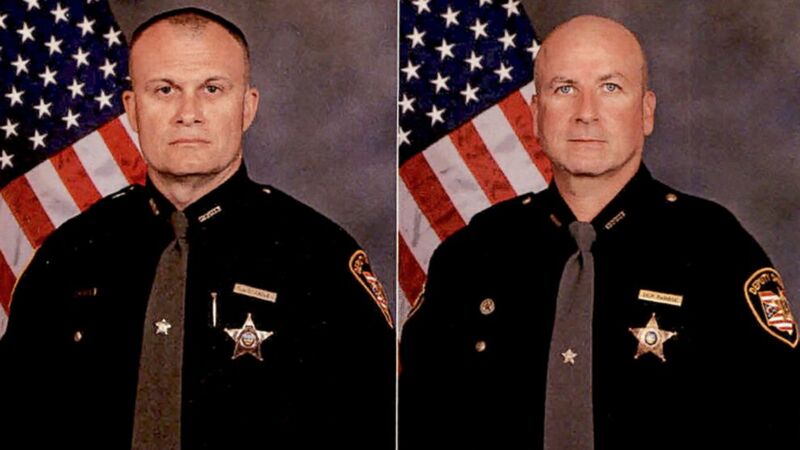 "Deputy Brewer gave his life attempting to help a person who was admittedly suicidal," Clermont County Sheriff Steve Lehey said in a statement Sunday morning. "This will forever change the atmosphere of the Clermont Sheriff's Office." The deadly standoff unfolded at about 7 p.m. on Saturday when a man called 911 and told a dispatcher that Winn had barricaded himself in his apartment, was armed, suicidal and refusing to leave, officials said. Ohio Attorney General Dave Yost said Winn was "involved in a burglary attempt" prior to barricading himself in the apartment of the man who called 911. Brewer and Lt. Nick DeRose responded to the call and came under fire around 10:30 p.m. at the Green at Royal Oaks Apartments in Pierce Township about 20 miles southeast of Cincinnati on the Ohio-Kentucky border, officials said. (Clermont County Sheriff's Department) Detective Bill Brewer (left) and Lt. Nick De Rose are pictured in this undated photo released by Clermont County Sheriff's Department. The mortally-wounded Brewer was taken to Anderson Mercy Hospital in Cincinnati, where he died, officials said. "This Officer's valor is now recorded for all time, written in blood," Yost said in a statement. "We mourn, and we will remember." DeRose, a 22-year veteran of the Clermont Sheriff's Office, was treated for a gunshot wound at University of Cincinnati Medical Center and released, officials said. "It's a very sad morning for the Clermont County Sheriff's Office," said Capt. Jeff Sellars, a spokesman for the agency. The area around the apartment building was shut down as Winn allegedly continued firing throughout the night. Cincinnati ABC affiliate WCPO-TV reported hearing shots around 10:30 p.m. and just before midnight. (Clermont County Sheriff's Department) Wade Edward Winn is pictured in this undated photo released by Clermont County Sheriff's Department. The Clermont County Special Response Team and a SWAT team from the Cincinnati Police Department responded to the scene and evacuated neighboring residents. Crisis intervention officers attempted to negotiate with Winn via bullhorn, asking him to surrender. At about 6:30 a.m. Sunday, police were heard shouting at Winn on the bullhorn, repeatedly saying, "Come outside. We won't hurt you. We won't hurt you," WCOP-TV reported. A few minutes later, police sirens sounded and an officer was heard yelling, "Go, go, go!" followed by gunshots and fire that broke out at the apartment complex. 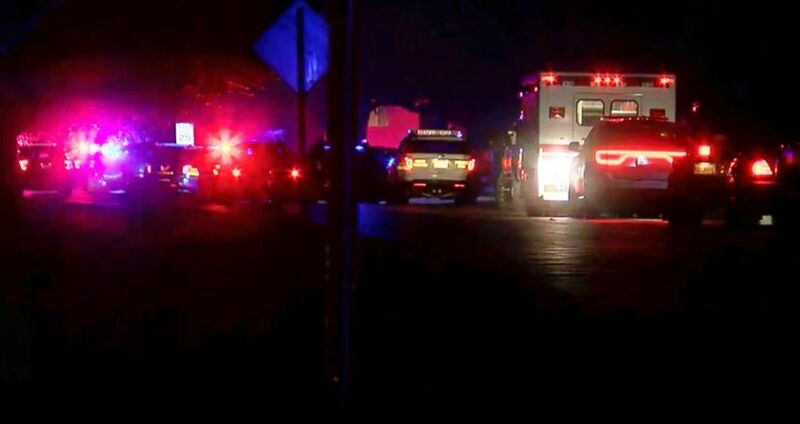 (FOX19Now.com via AP) In this image made from a video provided by FOX19Now.com lights illuminate police vehicles as authorities respond to a standoff at an apartment complex in Ohio, about 20 miles east of Cincinnati, Feb. 3, 2019. The suspect was taken into custody by SWAT team members who "endured a barrage of gunfire generated by Winn," officials said in a statement. It was not immediately clear what started the fire at the complex, but Sellars said a blaze erupted "as a result of the standoff." "The Clermont County Sheriff’s Office has requested the bureau of criminal investigations to handle the criminal aspect of the standoff," Sellars said. He said the state fire marshal's office is investigating the fire. Winn's criminal history includes several misdemeanor marijuana convictions, dating back to 2015, according to the Cincinnati Enquirer. In June, Winn was arrested for improperly handling firearms in a motor vehicle, according to the Enquirer. He was sentenced to five days in jail and placed on a month of probation, the newspaper reported citing court records. Brewer's death marks the fifth police officer killed by gunfire in the line of duty this year in the U.S. The fatal shooting came just 14 days after Mobile, Alabama, police officer Sean Tuder was killed while serving an arrest warrant on Jan. 20.